How do I Install Perforated Field Drain Tile? 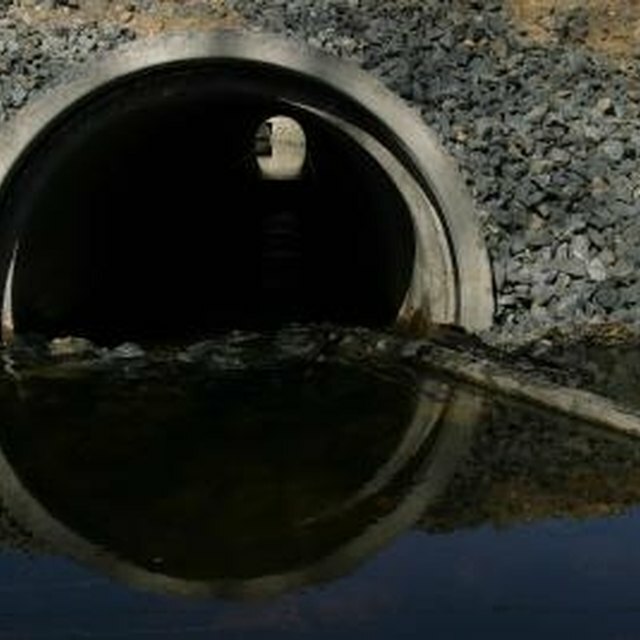 Drainage pipe is sometimes called French drain pipe. Black and flexible, it comes in 8-inch and 10-inch diameters and 20-foot lengths. The pipe has 1/2-inch holes located on one side of the pipe that drain water from the soil, into the pipe and out one end, which may be directed away from a water filled or soggy area. The average do-it-yourselfer can install drain pipe in one to two days, depending on the size and scope of the project. This drain pipe comes in various colors. Dig a trench 12 inches wide and 16 inches deep. Loosen the soil with a pickax, picking 2 to 4 inches at a time. Remove the soil from the trench with a square shovel, making sure that the trench remains 12 inches wide from top to bottom. Grade the trench so that it has a 1/2-inch slope every 4 feet draining away from the problem area. Pile the soil next to the trench so that you can cover the drain pipe. Install the perforated drainpipe into the trench with the holes facing up. The pipe comes rolled into large rolls and must be unrolled and threaded into the trench. If the pipe refuses to lie straight, place temporary blocks on it to keep it straight. Place a perforated pipe cap on the upper end of the pipe --- not the end that will drain away the water. Cover the pipe with filter fabric, also called landscaping fabric. Lay the fabric over the top and tuck the ends around the pipe and beneath its bottom. The fabric will prevent soil from clogging the holes on the pipe while still allowing water to drain through and into the pipe. Without the fabric, dirt will enter the pipe through the top holes and prevent drainage. Cover over the fabric with gravel, spreading the gravel along the pipe with a shovel. Check the thickness of the gravel and make sure that the depth remains a constant 4 inches along the pipe. This gravel will serve as an additional filter to keep the soil away from the drain pipe. Refill the trench with the remaining soil that you removed earlier in the step. Do not pack the soil. Rather, allow the soil to settle for a few days and add more soil to level the surface.